Barber's 'Adagio' Is Not The Saddest Music In The World How did Samuel Barber's stirring, lush work for strings — music that has become America's semi-official music of mourning — morph into a beloved and endlessly remixed dance floor anthem? 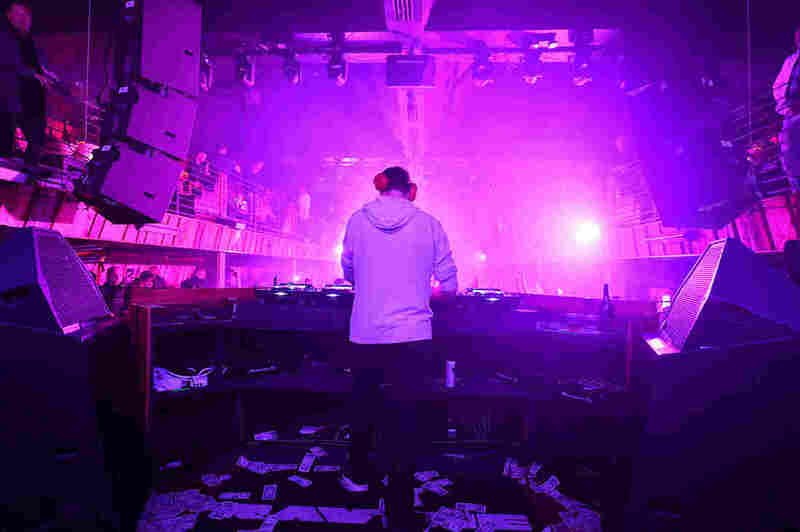 Dutch superstar DJ Tiesto (seen here performing in Miami in February 2019) released a massively popular electronic reworking of Samuel Barber's Adagio for Strings in 2005. Samuel Barber's Adagio for Strings is one of the most recognizable pieces of classical music in the world. It's become America's semi-official music for mourning, used at Franklin Delano Roosevelt's funeral and after JFK's assassination. But somewhere along the way, it went from an anthem of sadness to one of joy. The Barber Adagio has been recorded dozens, if not hundreds, of times. Three of those have been made by conductor Leonard Slatkin. "This piece starts just with a single, very long melodic line in the violins," Slatkin explains, "which then goes over to the violas and then goes over to the cellos. It reaches a very strong climax, followed by what seems like an interminable silence. And then the music reappears for one last time and we hear, at the very end, two chords that might as well be saying 'Amen.' "
The Adagio for Strings arrived at the right moment, when America was still hurting from the Great Depression and Europe was sliding into war. The piece had its debut on Nov. 5, 1938, on an NBC radio broadcast conducted by Arturo Toscanini, who had already seen many European Jewish colleagues murdered. And it was the piece that Slatkin turned to after Sept. 11. At the time, he was chief conductor of the BBC Symphony Orchestra, which was slated to perform at a festive annual concert in London, the Last Night of the Proms. "Usually, it's a highly patriotic affair for Brits, who play things like 'Rule Britannia,' " he says. "Things that the public really takes to as their version of the Fourth of July. But it also has a lot of silliness to it, where there are costumes and party hats and people are making a lot of noise." But four days after the attacks, Slatkin just couldn't do happy music and party hats. Instead, the orchestra played the Adagio. "I know that when it was over," Slatkin says, "I'm visibly crying. I just left the podium and I went in my dressing room and collapsed." By then, the work had gained such emotional heft that it had become a signpost for sorrow in the popular imagination. It's been used to cast a pall in numerous movies, perhaps none more so than the 1986 Vietnam war film Platoon, where the Adagio swells again and again to evoke the pain and devastation of war. But today, many younger people experience the Barber Adagio as something else: a heart-thumping, fist-pumping, dance music anthem. Dutch DJ and producer Tiësto's version from 2005 is just one of easily a dozen reworkings of the Barber Adagio — and it's got nearly 90 million views on YouTube. English musician and producer William Orbit knows the Adagio's power in dance clubs firsthand. "If I'm DJing, no matter what the type of music I'm playing — it could be some pretty grindy tech house, which is what I love, or it could be a party set, which is just what everybody wants to hear," he says, "someone is going to come on up and say please play the Adagio." Orbit was one of the first electronic musicians to adapt the work. "It's got that rare thing," he observes: "It sounds simple, but it isn't." His version of the Adagio, played on synthesizer with an added bass pedal, went to No. 4 on the U.K. singles chart in 1999. Adding to the popularity of Orbit's reworking was a remix by Dutch DJ and producer Ferry Corsten. "You change the tempo, you change the character, you know?" Corsten says. "If you listen to my remix, it has this big breakdown with the string orchestra part, where you definitely go back to your original dramatic sort of thing. But once that synthesizer starts taking over the main melody, and starts rolling into a sixteenths sort of measure, and this beat at 135 bpm starts picking up, all of a sudden this almost becomes happy. It serves as a complete mood shift. "This is the time when trance music was really peaking," Corsten continues. "And that was the roller coaster you tried to create. One minute, you're completely sad, and about to cry," he laughs, "and then the next, you're throwing your arms up in the air. Apart from telling the Adagio melody story, it also tells you what was happening on the dance floor almost 20 years ago." Orbit says he can't quite put his finger on what it is about Barber's original that makes the Adagio so appealing to so many people — unless it is that undefinable simplicity. "I see it as layers of mist that shift," Orbit says. "And that's the beauty — it's amorphous layers. The thing is, because they don't have this obvious structure, they just wrap themselves around whatever thoughts you've got without being cloying. I think that's partly its potency." In the remixes of the piece, the music moves from a place of collective mourning to collective ecstasy, says Elizabeth Margulis. She's a music cognition researcher at the University of Arkansas who studies how people experience music, and she says that part of the appeal is that sense of getting swept along. "People say, 'I feel like I was the music.' You know, you lose a sense of your own kind of bounded self, and feel like you get really gripped and taken along with what's happening musically," she says. "I think that's part of what the Adagio is being asked to help effect." Margulis says it has as much to do with what listeners bring to the music with what the composer put in it. "People are convinced that music seems so natural. It just seems like whatever you're experiencing is in the sound, right? But it's really this deep partnership between culture and experience, and the affordances of the sound and the limitations and potential of your perceptual system. It's all of those interactions," she says. That's what Margulis' ongoing research with participants around the world is showing. "What we're finding in our own work," she says, "is that the sort of story you hear in any particular excerpt of music says a lot about your background and the cultural world you had coming into that experience." In the eight decades since it was written, subsequent generations have brought their own experiences to the Adagio — and that's made it even more meaningful, William Orbit believes. "It's like a kind of musical blockchain," Orbit says. "It's been in so many films, and potent moments in history, and funerals, and Platoon. And everybody's got all that and it stacks up in their appreciation — so when they hear it, it's loaded with more and more things. It just picks up this potency as it travels around the decades." And sure, speeding up the piece, and putting a thudding beat underneath it, changes the emotional quality of this music that's been coined "the saddest music ever written." But Leonard Slatkin thinks that even in its original form, the Adagio for Strings holds another kernel of emotion. "I don't know what's the saddest piece of music ever written," Slatkin says, "but this piece, the way it ends, gives you a glimmer of hope. Not sadness at all."